This voter registration card was created after the Democrat-controlled North Carolina General Assembly passed a Suffrage Amendment in 1900. The Democratic Party gained control of the Assembly in 1898 by running on a white supremacist platform, an agenda they continued to support once in power. The Suffrage Amendment imposed literacy tests and poll taxes that denied many poor North Carolinians, regardless of race, the right to vote. Special provisions in the law, however, provided at least nominal protection for white voters by exempting those who were already eligible to vote before January of 1867 (before the passage of the Fifteenth Amendment extended this right to African Americans) or who had an ancestor who met this requirement. Although James Moody, the man registered on this card, was likely illiterate (as judged by his use of a mark rather than a signature) and would not have been eligible to vote in 1867 because of his age, he had an ancestor who could vote that year (William Moody) and was therefore still able to register. UNC School of Education, "Voter Registration Card from Alamance County, 1902," Learn NC: North Carolina Digital History, http://www.learnnc.org/lp/editions/nchist-newsouth/4731 (accessed January 16, 2012). I do solemnly swear (or affirm) that I am a citizen of the United States and of the State of North Carolina: I am 53 years of age: I was on the first day of January, A. D. 1867, or prior to that date, entitled to vote under the Constitution and laws of …, in which I then resided (or, I am a lineal descendant of William Moody who was on January 1, 1867, or prior to that date, entitled to vote under the Constitution and laws of the State of N. C. wherein he then resided). Sworn and subscribed before me, this 22 day of Oct 1902. 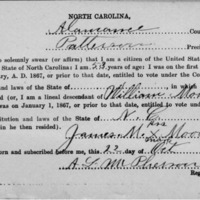 A. L. McPherson, Voter Registration Card from Alamance County, 1902, Civil War Era NC, accessed April 24, 2019, https://cwnc.omeka.chass.ncsu.edu/items/show/14.